Receive quality service from founders Ray and Emile Tucker, who started it all in November 2009 and gladly serve Sand Springs, Oklahoma. Your family’s safety is important to us, and you’ll be happy to know Ray is a law enforcement retiree with over 40 years of service. 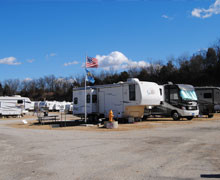 Whether you’re visiting Sand Springs for pleasure or business, you’ll love our location. Take a quick trip to nearby Tulsa for shopping or attractions. Stay with us for business trips with easy access to Tulsa and great amenities like WiFi. We welcome all individuals and understand your occupational needs. With our park that is open 365 days a year, you can schedule your business trip or family vacation any time of year. Choose your length of stay; whether it’s a day, a week, or a month, you’ll receive great rates. You can even bring your pet with you! We love having furry friends around. However, since your safety is our utmost concern, please don’t bring any aggressive dogs or pit bulls. Check out some pictures of our beautiful park before you visit, or go ahead and speed up the process by making your reservation online today!